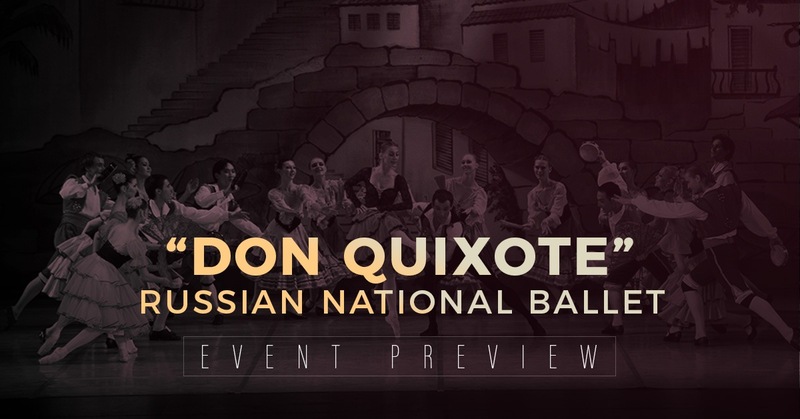 The Livermore Valley Performing Arts Center welcomes the return of the Russian National Ballet in February with their acclaimed production of “Don Quixote,” the story of the final quest of Cervantes’ famous nobleman. Dedicated to preserving the timeless beauty of the Russian ballet tradition, the Russian National Ballet is known for offering exceptional dancing, classic choreography, and exquisite costumes on their annual tours worldwide. The full-length production of “Don Quixote” will be presented in a single performance on Friday, Feb. 8 at 8 p.m. The ballet is based on an episode taken from the famous novel “Don Quixote de la Mancha,” written by Spanish author Miguel de Cervantes in the early 17th century. An aging nobleman surrounded by books telling the tales of long ago knights, Don Quixote becomes convinced by a dream that he has been called to perform noble deeds in the service of the beautiful Dulcinea. So he sets off with his loyal squire Sancho Panza in search of adventure. Mistaking a lovely village girl named Kitri for the mysterious Dulcinea, he makes several misguided attempts to rescue her from an unwanted marriage, including challenging windmills he sees in the distance and believes are giants. Although Don Quixote is unexpectedly successful at freeing Kitri, he comes to realize by the end of the ballet he has not yet found his Dulcinea and sets off for more adventures, leaving Kitri to her own happy ending. The Russian National Ballet was founded in Moscow in the late 1980s, a time of tremendous creative growth and artistic development in the Soviet Union. The legendary former principal dancer of the Bolshoi Ballet Elena Radchenko, founder and artistic director since 1994, now leads a company of over 50 premier dancers from across Russia, many of whom have been with the company since its inception. She is committed to upholding the grand ballet tradition, including many works that honor the original choreography of Marius Petipa such as “Giselle,” “Don Quixote,” “Sleeping Beauty,” “Swan Lake,” and many others. Originally choreographed by Marius Petipa to the music of Ludwig Minkus, “Don Quixote” was first presented by the Ballet of the Imperial Bolshoi Theatre of Moscow on Dec. 26, 1869. All modern productions of the Petipa/Minkus ballet are derived from the version staged by Alexander Gorsky for the Bolshoi Theatre of Moscow in 1900. The Russian National Ballet’s production includes the ballet’s traditional choreography paired with exquisite costumes, making the charming story of “Don Quixote” a pure delight for all ages. Tickets to the Russian National Ballet’s production of “Don Quixote” start at $50. Keep in mind the Livermore Valley Performing Arts Center offers student and military tickets to nearly every performance. Please contact the LVPAC box office if you need student, military, or ADA tickets. This performance is expected to sell out quickly, so get your tickets as soon as possible. Don’t hesitate to contact the LVPAC staff with any questions you may have. We hope to see you at the Bankhead Theater!